Despite my ever growing sunglasses collection, there's one style that I always turn to and that is the classic aviator. It's a style that has this inherent coolness factor that's unmatched by anything else on the market. When it comes to aviators no brand is more iconic and synonymous with the name than Ray Bans. Since it's first debut back in 1936 (thank you Wikipedia) not much has changed over the years. The classic tear drop shape is still unaltered, the lens has the same slight convex shape to eliminate glare from all angles and the famous thin wire frames are still bendy enough for you to salvage them if (or when in my instance) your toddler decides to sit on your glasses. There's so much to love right? But the true bee's knees is that these sunnies were once designed with only pragmatism in mind and have since turned into absolute style icons. Now 80 years later and we're all still wearing them like it's nobody's business. 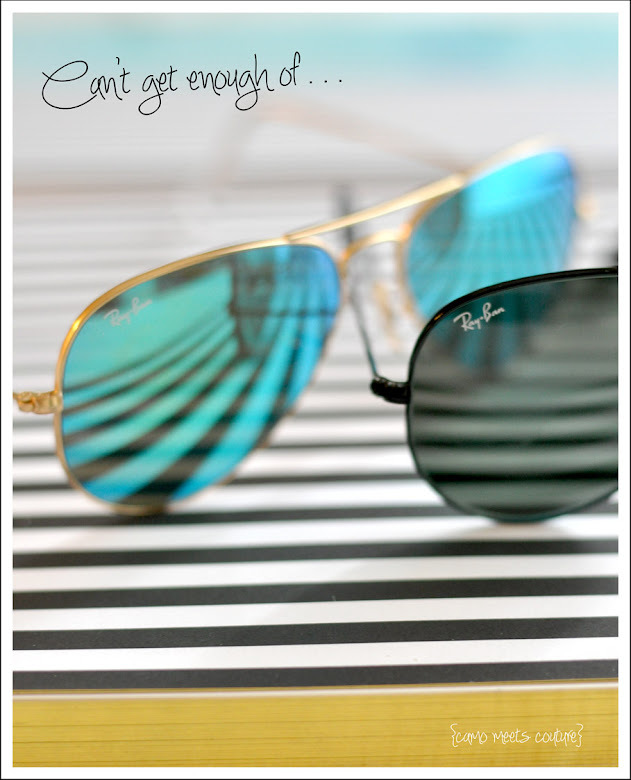 Pictured above: Ray Ban aqua mirror lens and Ray Ban black frame polarised version. I can see why you want those bad boys in your collection. Nothing beats a great design which Ray Ban has proven. i am completely in love with my ray ban aviators as well, no better glasses out there! i really want to get the turquoise mirrored ones too, so stylish! Wow, they're amazing... Xoxo V.V. A couple of months ago my aviators fell out of the stroller and I ran over them :( i got club masters to replace them but they just aren't the same! I love ray-ban, aviators, clubmasters, wayfarers are timeless. I can't get enough of Ray Bans, period! They're definitely my favorite sunglass brand, and I own a few versions of the wayfares, aviators and clubmasters. To my credit, I've never lost an expensive pair of sunglasses–only my cheap ones! loving your blog- -you have fantastic style! i love the aqua mirror lens aviators! i feel like theyve been popping up in the fashion world and are the next sunglasses trend! Aviators are kind of the ultimate classic trend. But they look horrible on me! Depressing, right? I love mine, don't like copies and love your shot of them, aviators all the way! I definitely need a pair of classic Ray Ban aviators. They are such a classic! Ray bans look so great on everyone. Looveeee! One can never go wrong with aviators. Wayfarer is my fave. But I always keep my aviators handy. They look great. I don't own a pair and can't really visualise myself wearing them but certainly a sunnies classic that's here to stay.